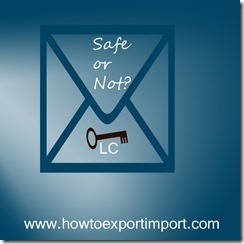 Is Letter of Credit (LC) a safe mode of payment for an Exporter?- Some tips to exporters. As per the terms of contract, your overseas buyer agreed to open LC against the shipment to be effected by you. As you know, letter of credit is a safe mode of payment commonly for any business especially in international business also. Once after opening letter of credit in your name as beneficiary, your overseas buyer sends a copy to you by fax or mail. The original can be collected from your bank. Because, letter of credit is opened by your buyer’s bank to the seller’s bank, mentioning beneficiary of LC as you (seller). Any seller or exporter will be happy in opening a letter of credit as terms of payment because the payment guarantee is more assured than shipping by documents against payments (DAP or DA) or documents against acceptance (D.A). As per letter of credit, the opening bank of LC (buyer’s bank) guarantees to effect payment to exporter through exporter’s bank as per the agreed terms and conditions mentioned on letter of credit. My first tip to exporters is, make sure Letter of Credit (LC) has been opened with a prime bank. In other words, the opening bank (buyer’s bank) of letter of credit should be a prime bank. Who is a ‘prime banker’ . As per the details of assets and liabilities based on the annual financial report of each bank all over the world, the authorities related to banking prepares prime bankers list. The prime banks are the banks who are strong financial background with sound assets and have been serving people with best service. The prime bankers data base will be available with all major reputed banks all over world. You can check this data with your bank. Or your bank may help you to whom to be approached to get the said data. My second tip to exporters while opening an LC is ‘check the authenticity of Letter of Credit (LC)’. How to check authenticity of letter of credit (LC)? There are many banks all over world. Now a days, after the introduction of globalization of trade, a number of banks and financial institutions have been introduced all over world with least restrictions within the country. Some of them have been working without any regulations by government also. As I have mentioned previously, you can approach your bank with the copy of letter of credit to verify whether the said LC has been opened by a prime bank. Why LC with a prime banker is safe? : The financial strength and reputation among people are very high compared to other banks. So, the prime banks work professionally as per their standard banking norms. No individual or firm can influence to violate the banking rules and regulations especially the norms of international trade. This helps the clients globally to depend prime banks for smooth handling of export import business. You can also read more information by clicking Letter of credit - How does LC work? What are the advantages of Letter of Credit to Exporter? 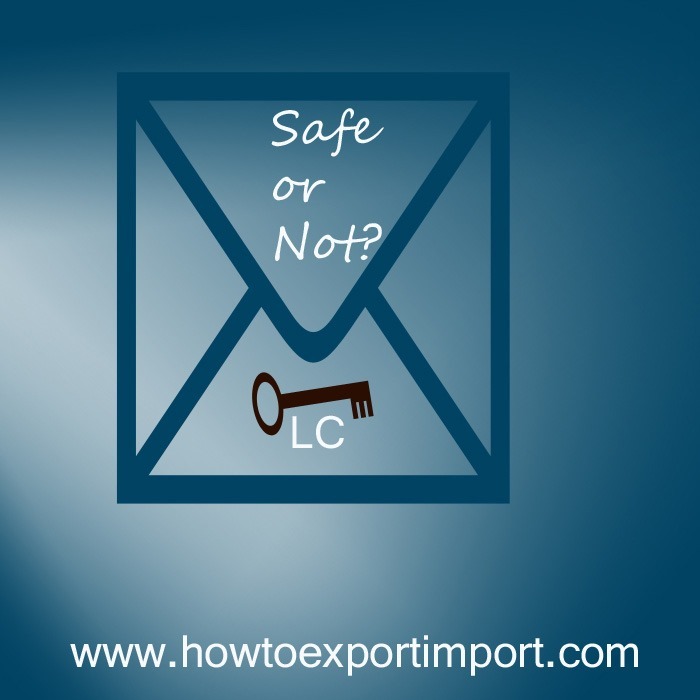 How LC is benefited to Importer? Are there any disadvantages to importer for a consignment under Letter of Credit? What are the disadvantages of LC to an exporter? Who are the parties involved in Letter of Credit? How to check authenticity of LC? What is Prime Banker? Yes, I am sure, once after going through that articles you will have a good knowledge about Letter of Credit. munish: On 15 July 2015 1.? Is it necessary for negotiation that LC opening bank should be the correspondent bank of beneficiary's Bank other wise export bill documents will sent on collection. 2.? If there is a clause for reimbursement from 2nd other bank instead of opening bank for lodging claim but LC opening bank is not correspondence bank of beneficiary bank .Can beneficiary bank claim reimbursement from reimbursing bank same day as documents sent on collection to LC opening bank. or if not is there any possibility for doing same by giving beneficiary undertaking to their bank. What is an Advance Payment in International Trade? What is a Letter of credit in International Trade? What is deferred duty payment? Define Documents against acceptance (D/A). How to export from India to France?